This article is about the species of Kremling from Donkey Kong Country 2: Diddy's Kong Quest. 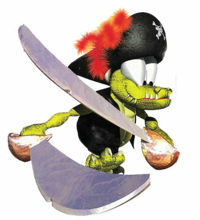 For the character of the same name from the Donkey Kong Country animated series, see Kutlass (character). Kutlasses are small, yellow members of the Kremling Krew in Donkey Kong Country 2: Diddy's Kong Quest. Kutlasses wear pirate hats with a large red feather in them, as well as a black vest. Kutlasses also carry twin swords which are much too big for them; the game's manual humourously says that they ordered them off of an infomercial and that they looked smaller on television. Though the swords are their strengths, capable of counter-attacking jumps, they can also be their weakness. They swing the swords downward with such force that they get stuck in the ground, leaving them open to attack. Even when their swords are up, they can still be defeated by a barrel or a tag-team throw. In later levels of the game, a green version of Kutlass is encountered. These Kutlasses are faster to attack and can pull their swords out of the ground faster. According to the game's credits, Kutlasses belong to the "Kremling Kuthroats" enemy class. Kutlass' name is based on the cutlass, a kind of sword commonly used by pirates and the kind of sword Kutlass uses. The Game Boy Advance version of Donkey Kong Country 2: Diddy's Kong Quest assigns voice-files to Kutlass. They are virtually identical to the ones associated with Kosha (a similar enemy from Donkey Kong 64), except that they are higher-pitched. 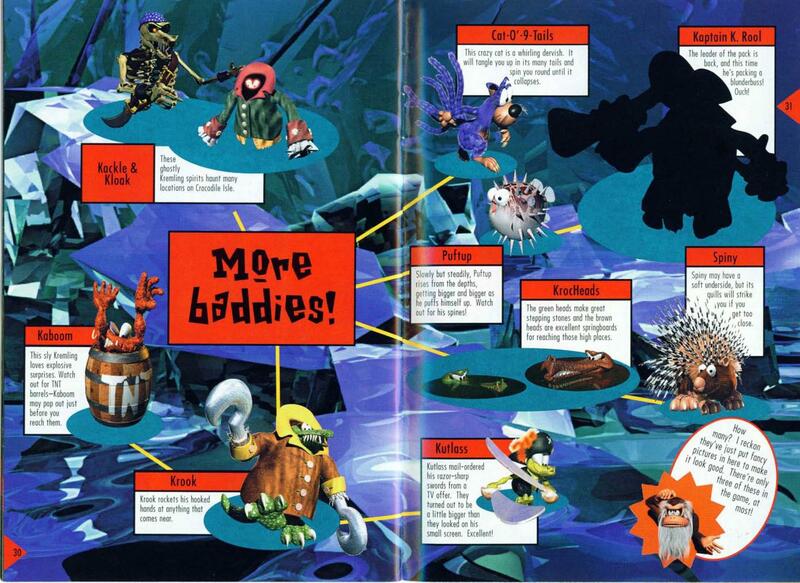 ↑ Donkey Kong Country 2: Diddy's Kong Quest instruction booklet, page 31. This page was last edited on March 16, 2019, at 21:44.